Wireless Field Day 6 is quickly approaching! The sponsors of this week's are a varied bunch. Some new, some returning for another WFD event. It's guaranteed to be information packed and technologically mind melting! I'll be reunited with returning delegates Blake Krone, George Stefanick, Keith Parsons, Lee Badman, Jake Snyder, Sam Clements and Scott Stapleton and exposing the new delegates to the typical WFD hazing (joking!!). The new delegates are: Germán Capdehourat, Evert Bopp and Richard McIntosh. As it stands today, I'm most curious about the Disaster Tech Labs and Plan Ceibal presentations, but that's because each of these organizations provides an invaluable resource to disaster survivors/responders (Disaster Tech) and helps the future of Uruguay through the country's youth (Plan Ceibal). I did my homework on Plan Ceibal (the one laptop per child project started in Uruguay in 2007) and found a heartwarming story of technology helping to enrich the lives of all Uruguay's state run school children. I've known Evert (Disaster Tech Labs) through twitter for some time, and I know he's been involved in bringing wireless communications networks to a great many places where natural disasters have occurred. Aside from that, I'm looking forward to hearing what's new at AirTight, Aruba and Xirrus as well as learning more about Cloudpath and Extreme Networks. I'll be blogging, photographing and tweeting the event, so tune in to www.techfieldday.com for the live video feeds and watch the #WFD6 hashtag on twitter for the full conversation. A lot of technology has recently entered the world of retail analytics. Some of it leverages Wi-Fi, some Bluetooth, some audio, but all of it is competing for your customer loyalty (Big Data). The crux of it all is an attempt by the retailer to engage with you, the customer by giving you coupons/discounts in trade for your demographic data or because you completed a task. Gigwalk connects people/companies who need workers to fulfill temporary workload. Users of Gigwalk can agree to fulfill a requested task/service and receive payment via PayPal. You can think of it as a way for an employer to hire a temp worker without ever performing an interview. Gigwalk is an interesting way to connect employers with employees to complete piecemeal work. It reminds me a little of TaskRabbit but less errand/chore based and more task completion. Checkpoints awards you points for completing surveys, watching videos, shopping online etc. Checkpoint is aligned with manufacturers instead of retailers. inMarket operates the largest mobile shopper platform and the underlying technology used is the iBeacon platform. iBeacons leverage Bluetooth Low Energy (BLE) to create a location-aware, context-aware wireless network within a retail establishment. The proximity information can be used to send targeted marketing to nearby smart phones to encourage purchases or to award users of the app with points for scanning product barcodes into the app. "record, determine or use information about or from another content delivery platform (for example, to unlock potential rewards or offers based on your watching of a specific a commercial or show that is broadcast on your television or on the web, the shopkick application may ask you to open the app while you are watching TV, and then we may record or analyze the audio signal from the television set via the shopkick app and your cell phone’s microphone, to determine the commercial, and/or program, including the date and/or time), and (v) record information derived from such above information and other sources such as entries and offers viewed on our website or on our social media presence, or information provided by Affiliated Partners (collectively, “Non-Personally Identifiable Information”)." Stepsaway is another shopping app that detects customers' smart phones when they are near stores in shopping centers or other public spaces. Stepsaway allows retailers to use a cloud managed platform to push notifications to customers within range of their stores. It is abundantly clear that the customer is actually the product. Brick and mortar stores are competing with one another for the attention (and wallet) of the consumer. Retailers are willing to offer exclusive discounts to customers to win/retain customer loyalty. What you're trading for those discounts is more than just the space the app takes up on your phone. You're often asked to trade your phone contacts, access to your photos, microphone and location in trade for access to the perceived benefits of the rewards network (via the app). I'm not the target audience for customer loyalty/shopping apps, but the things I've been reading started me thinking about privacy issues, potential legal issues and how to avoid inadvertently contributing to the demographic database pool. 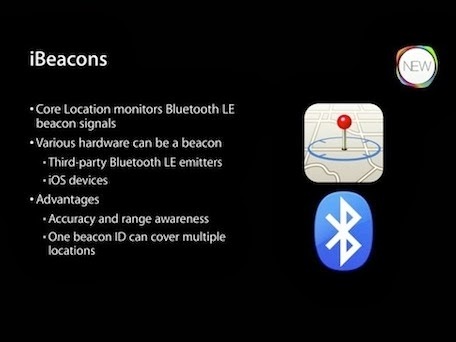 The fact that the iBeacon technology is Bluetooth with a different name leads me to wonder about how much interference iBeacons add to the 2.4GHz spectrum. How does a wireless infrastructure differentiate between an iBeacon and a Bluetooth source of interference? Wireless technology is evolving quickly in many disparate ways. It's unclear how iBeacons will be used outside of the retail vertical, or when an active/passive RFID implementation would be preferential over Bluetooth. It's an exciting time in the world of wireless! Some of it makes me a little leery, but I'm hopeful for the possibilities of a more connected world.